Happy Hump Day! Valentine’s Day is almost here, and what’s sexier than soft, smooth skin? 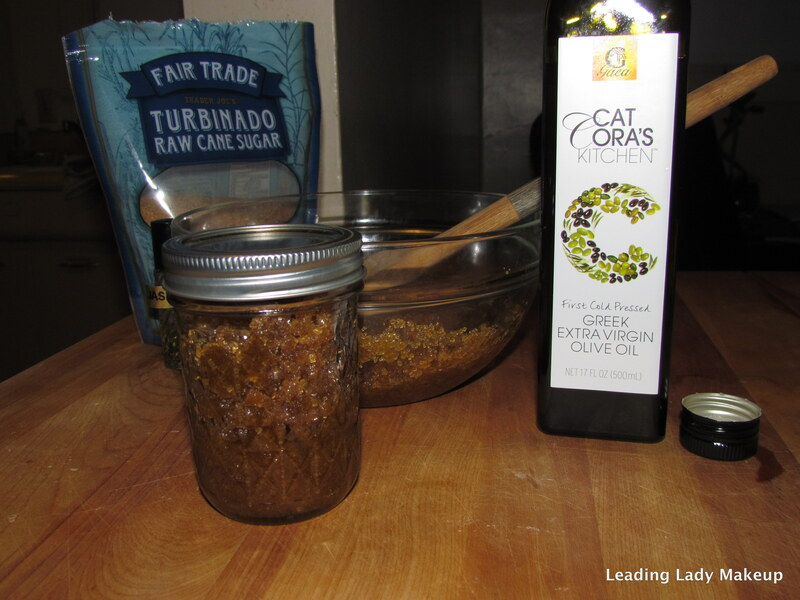 I’m a huge fan of DIY body scrubs and have come up with another recipe to share with all of you. These are all ingredients you can find easily at a natural foods grocery store like Whole Foods. 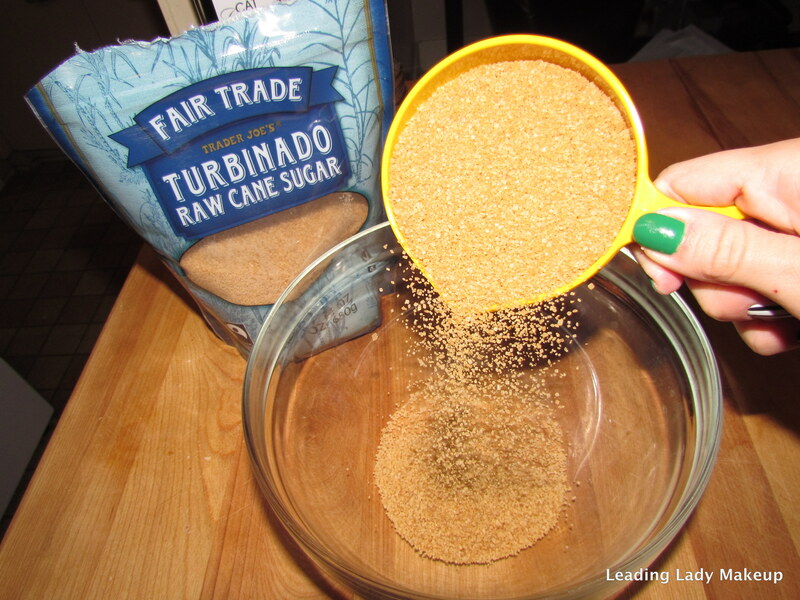 Turbinado Sugar– it’s just big particle sugar, I recommend Trader Joe’s Turbinado Raw Cane Sugar. It’s all natural with no added preservatives or yucky stuff! 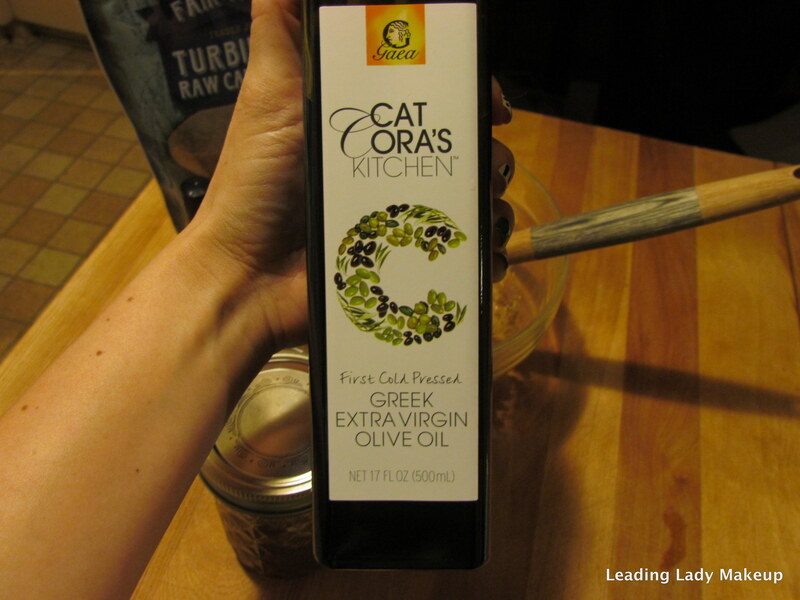 Extra Virgin Olive Oil– I recommend Cat Cora’s Kitchen by Gaea. Gaea is a sustainable and eco-friendly business, which I love. Plus, a portion of their proceeds goes to Chefs For Humanity in their fight to end hunger. Essential Oil– I picked jasmine because I’m a floral-notes kind of girl, but you can pick any scent you want! Vanilla or Orange would smell delicious, too. I don’t have a favorite brand, but I do recommend supporting your local small businesses and purchasing one from a neighborhood farmer’s market if you can. It’s very important that you use an Extra Virgin Olive Oil. What’s the difference, you ask? Extra-virgin olive oil comes from the first pressing of the olives. Extra-virgin olive oil has higher levels of Vitamin E, Vitamin A, chlorophyll and magnesium than regular and “just virgin” olive oils. We need all those high-level vitamins to feed our skin and boost its glow! 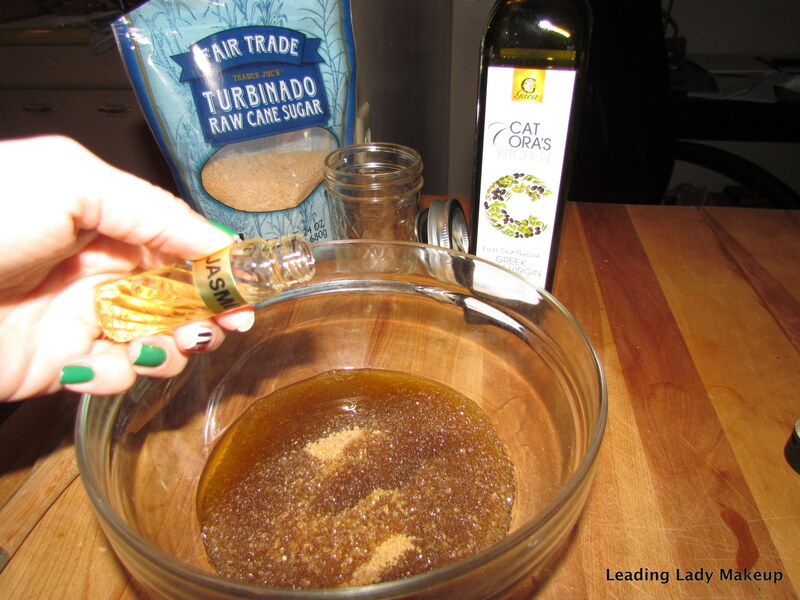 STEP 2: Pour 1/2 cup of extra virgin olive oil into the mixture. STEP 3: Pour 5-6 drops of your favorite essential oil into the mixture. STEP 5: Stir until you get a grainy, lumpy consistency. It should literally take you 10 seconds. STEP 6: Pour it into a glass jar of your choice. Done! I suggest using this body scrub in the shower after you have already washed and shaved. Scoop out a small amount and work this in circular motions onto your arms and legs, focusing on dry areas like elbows and knees. It’s amazing on feet too! Rinse off and pat yourself dry with a towel. You won’t even need lotion afterwards. I like doing this twice per week in the winter, and once per week in the summer. The sugar granules will slough off dead skin cells that collect on the top layer of your skin. The extra virgin olive oil will hydrate the new skin underneath and leave your skin glowing. The essential oil will make you smell yummy. What’s not to love? 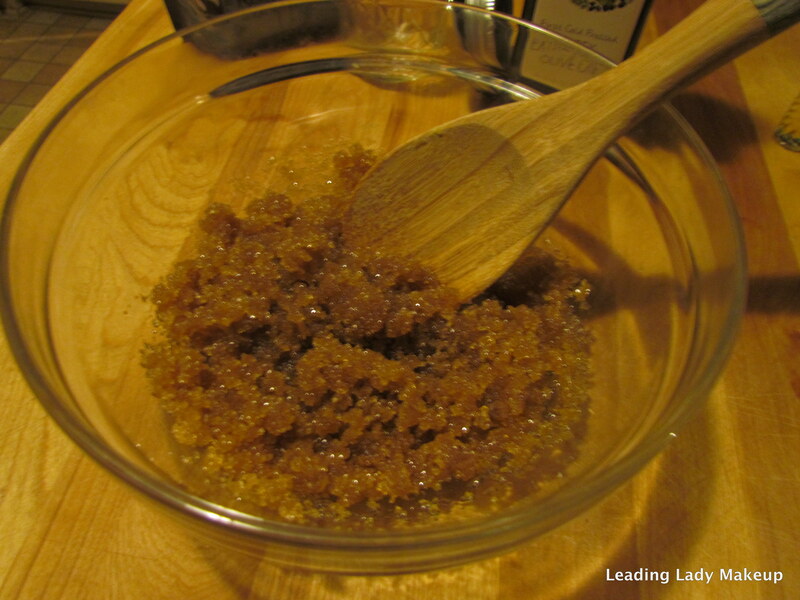 Here’s a step-by-step video I did on another body scrub made with almond oil, which is tougher to find than olive oil. Just replace the almond oil with olive oil for this body scrub. 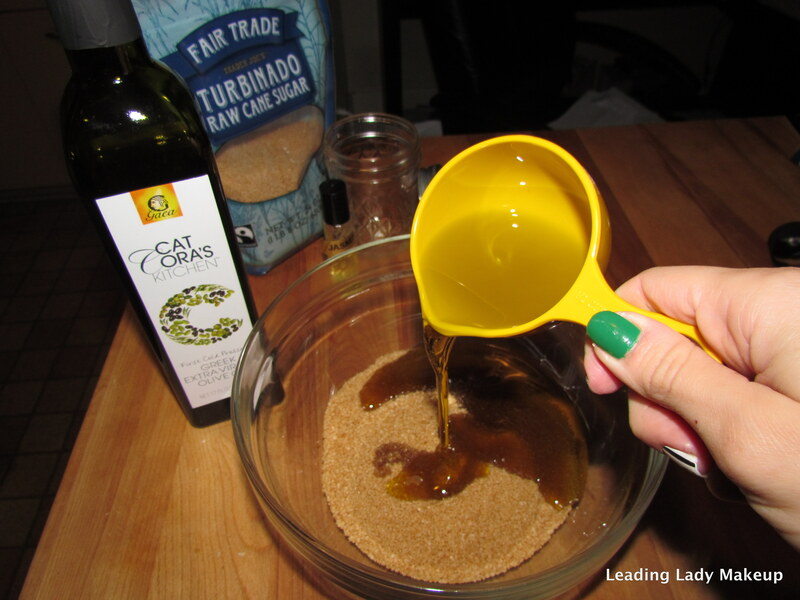 Let me know if you try this DIY body scrub, I’d love to hear your thoughts!